If you read our Bravo Concealment BCA OWB holster review, you may recall that we received it in a two-holster bundle along with the IWB Torsion holster. 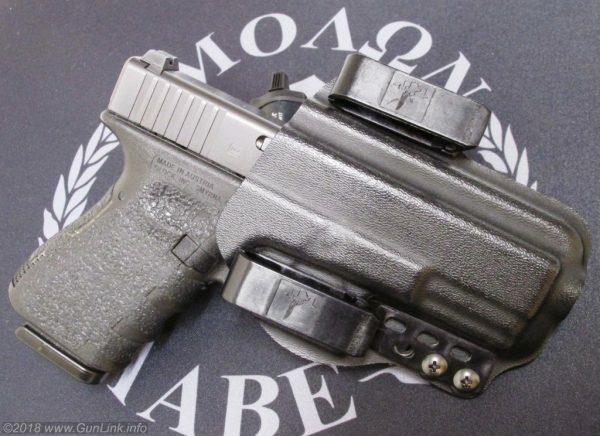 The OWB holster to accommodate a Glock 19 fitted with a Streamlight TLR-1 was what we were originally hunting for so it got reviewed first, but now that we have had a chance to get some real-world CCW use in with the Torsion we will be reviewing it. 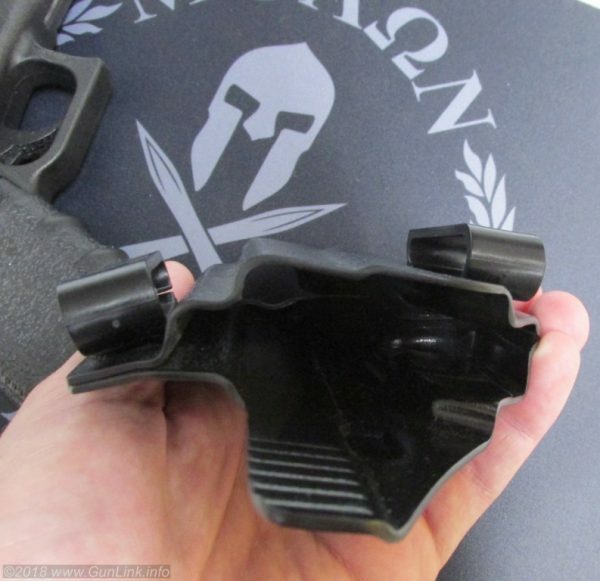 The holster that we tried out is the Bravo Concealment Drop Out of Sight (DOS) Torsion holster for a Glock 19. 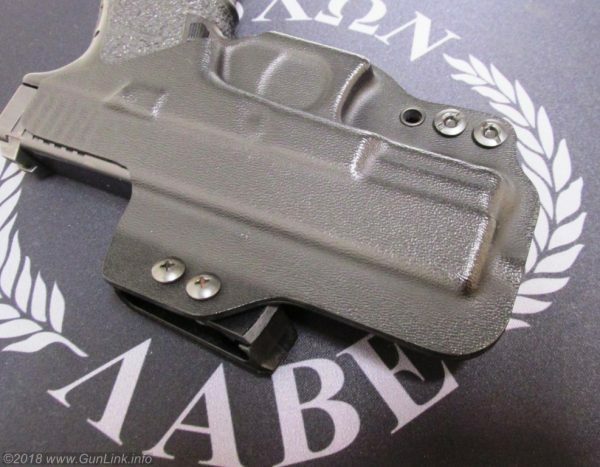 This IWB holster is the newer generation of the standard DOS that Bravo has been making for a while. 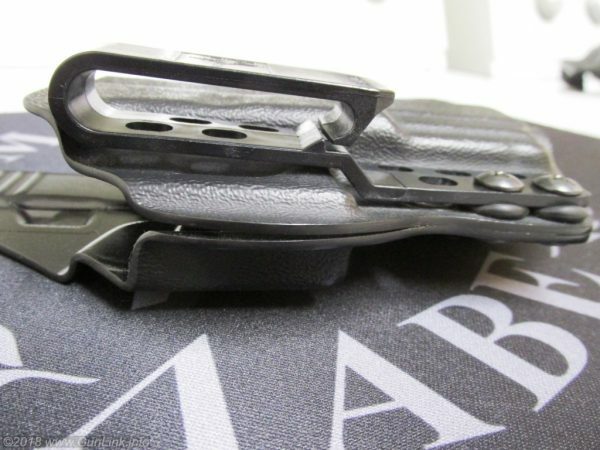 The "Torsion" name comes from the design of the holster, which incorporates a slant-clamshell design and inward-facing front clip to impart a 10-degree angle to pull the grip of the firearm in close to the wearer's body for better concealment, especially when using it as an appendix (AIWB) holster, although the holster is suitable for both AIWB and strong-side carry. One of the first things to notice about the Torsion is what I can only describe as the "sleekness" of it. There is hardly any excess about the holster - no superfluous doodads, no back-pad, no wide wings, or anything else of that nature. What there is, is a slim Kydex holster barely any bigger than the firearm itself. Like the BCA, the Torsion is not molded around a Blue Gun but, rather, custom-made CNC Machined plates that yield exact, consistent shells that perfectly match the firearm's shape and fit snugly to it. Not only does this close fit look great and provide good passive retention (at the trigger guard), overall the holster adds next to no bulk to the firearm. The 0.08 Kydex thickness is middle-of-the-road (or is it Goldilocks-just-right?) compared to what I have seen from various manufacturers. I have seen thinner, which I would be concerned about (and have seen) breaking from use and I have seen thicker, which adds more bulk without necessarily making the holster substantially more durable. Thickness-wise, owing to the 0.08 Kydex, the holster adds well under a quarter-inch to the firearm, making it not much different in size than just tucking a firearm into your waistband - but without the dangers of shooting yourself in something important or having it Plaxico Burress down your pant leg. Height- and length-wise, it does add some minimal extra size to the firearm. My holster, and perhaps all of the holsters, is built to accommodate a threaded barrel, so there is about 3/8" to 1/2" of extra length past the end of the slide. The sweatguard stops about 1/4" from the rear of the slide, so it doesn't offer complete protection, but it also doesn't pinch or jab you. Since the rear clip rides directly over the trigger guard, there is negligible material below the trigger guard and only minimal material in front of the trigger guard where the clip attaches. 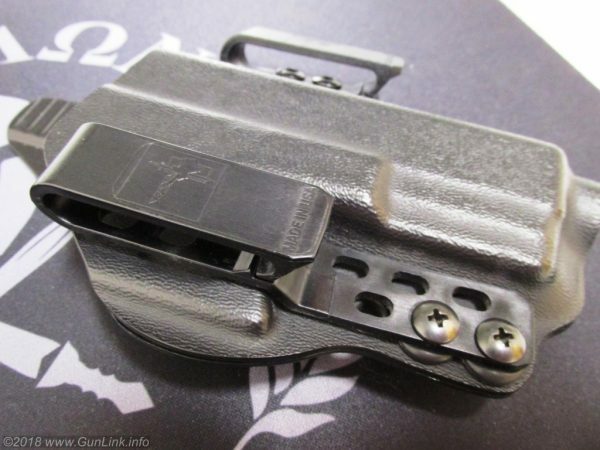 The top of the holster is formed to accommodate tall sights (for use with a suppressor or red-dot), adding a little extra height and beyond that is the wing to which the front belt clip attaches - totaling maybe 1.25" of holster above the top of the slide. So, all in all, a very slim, compact holster with almost no extra bulk. Like their OWB holsters, Bravo ships their IWB holster with a number of features that either used to always be (or, in some cases, still are) price-increasing add-on options. These include clearance for threaded barrels, tall sights, red dot sights, and extended slide stop levers. While this is likely, at least in part, a business decision so they don't have to field a bunch of different holster models, it's nice to have these types of features "baked in" without having to think about them or add them on. That small wing for the front clip is where the Torsion-magic happens. Some holsters - particularly AIWB holsters - add an extra "claw" or other device that sticks out below the rear of the holster to press out on the belt and draw the grip in closer to the body for better concealment. Rather than go that route, the Bravo Torsion brings the grip closer to the wearer's body by using an asymmetrical clamshell that positions the front clip significantly closer to the body than the rear clip. 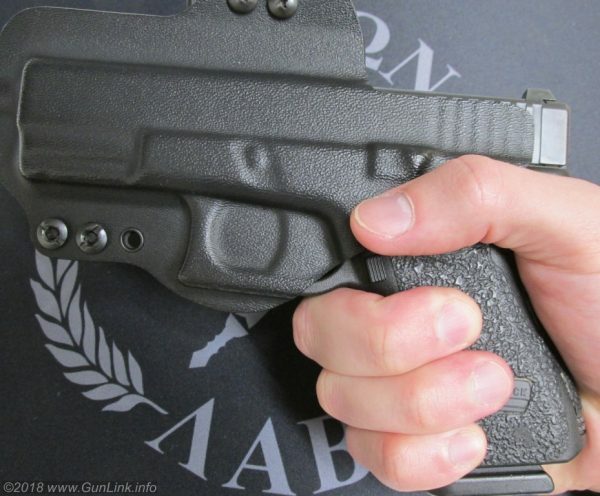 The result is that, instead of pushing the grip inward, the Torsion pulls the front of the holster out, rotating it around the axis of the rear clip, causing the grip to be snug to the body instead of jutting out. When used with both the front and rear belt clips attached, the Torsion does a good job of drawing the grip in close when worn AIWB, although some "claw" designs may do a better job. The Bravo Concealment Torsion offers a few levels of configurability. Ride height and cant are moderately configurable thanks to the clip design, but the range of available positions is not particularly wide - maybe 3/4" of height adjustment and a few degrees of cant. Adjustment, however, is easy with a couple of phillips head chicago screws with o-rings to act as buffers/nut retainers. One nice feature of the Torsion is its ability to be used with only the rear clip. Removing the front clip allows the Torsion to become "tuckable," leaving only a single belt clip showing when worn with a tucked-in shirt. I gather that this is the configuration that the company owner uses and I find it being the configuration that I use most often, despite seldom tucking in my shirts. The single-clip configuration, in addition to tuckability, has several more advantages, including greater ease of putting on or taking off the holster and easier on-the-fly adjustments (such as carry position). It is also more comfortable when used AIWB as it allows for shifting the holster angle when sitting, crouching, etc. When used with the single clip, the Torsion still does a decent job of pulling the pistol in tight to your body, but it is not nearly as pronounced as it is when used with both clips. We'll be frank here - carrying a pistol in this style of holster means stuffing a 1-2 pound chunk of unpadded plastic and steel down your pants. You are probably always going to know that it's there. The flip side of this is that it is a minimally-sized chunk of plastic and steel. There is no big padded backer to lay against you and make you sweaty or to bunch up or feel awkward. When carried AIWB, I found the extra length and somewhat sharp edges around the threaded-barrel accommodation to be a bit poke-y when sitting, but when used in the single-clip configuration, this can be alleviated by canting the holster. Thanks to its narrow design, the Torsion doesn't spread out the weight of the firearm across much of your belt as wider two-clip holsters might - especially, of course, when used with only one clip. If used with especially flimsy belts not meant for CCW, you may see issues with heavy pistols pulling down your pants where the holster sits - but you will find that with just about any holster. Concealment with the Torsion is phenomenal. As mentioned, the holster is barely any bigger than the firearm itself, so there isn't a lot of extra bulk in you waistband. The twist imparted by the holster pulls it in nice and tight and we had no problem with concealment anywhere from AIWB to 5 o'clock strong side carry. For strong-side carry, there was not much noticeable difference in concealment between the one- or two-clip configuration. However, in the AIWB position from 1-2 o'clock the presence of the front clip did hide it noticeably better. 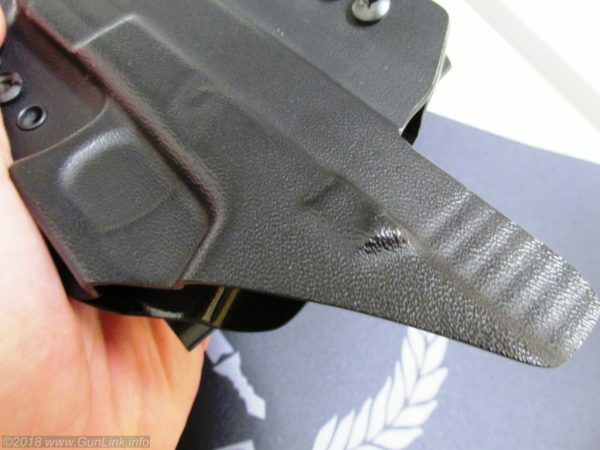 Retention in the Torsion holster is achieved, as it is with many Kydex holsters, with a ridge that holds on to the front of the trigger guard. Since the holster is molded so tightly to the pistol's shape, there is no "wiggle room" for the firearm to move around when holstered. The retention ridges grab on to the trigger guard at exactly the right point when the firearm is fully inserted into the holster; the firearm can not be pushed in any further once it clicks in to place and, upon drawing, it immediately engages the ridges since they click into the guard right at their edge. This passive retention system holds the firearm securely and passes not only the unloaded-upside-down-shake test but also the fully-loaded-upside-down-shake test. Throughout our testing, including being very active, we had no concerns about the firearm just falling out. The holster easily stays in place during the draw stroke thanks to the hook on the bottom of the clips. On the topic of drawing, the minimalist design of the Torsion means that there is not a lot of extra material around the grip or trigger guard area, which allows the user to get a good, full grip on the pistol so that it is ready for action as soon as it is drawn and presented. In a sea of Kydex holster manufacturers, it is easy to see why the Bravo name keeps rising to the top. The quality and design is outstanding, the prices are beyond fair, and the customer service hooked me when the company owner personally and immediately replied to my initial late-night message asking about holster features when I was shopping for an OWB light-bearing holster. If there is one ding against them that people might find, it is probably holster selection. You aren't going to find holsters to fit a lot of less common pistols, you aren't going to find a lot of left-handed holsters, and you aren't going to find a bunch of fancy options or colors. The Bravo Concealment Torsion Holster page lists a handful of guns from Glock, H&K, Sig Sauer, Smith & Wesson, Springfield, and Walther. If you want something else, look somewhere else. On the other hand, not fielding a bunch of oddball holster models means that they can crank out the ones that they do make, sell them at good prices, and ship them fast without a weeks- or months-long lead time. In addition to free shipping and a lifetime warranty, Bravo offers a 30-day money back policy so if you don't like it, they'll buy it back from you.